Winter is a time of rest for gardeners in the Hamptons. But before winter sets in, it’s wise to clean up the garden and prepare the plants that will remain in place through the cold weather. 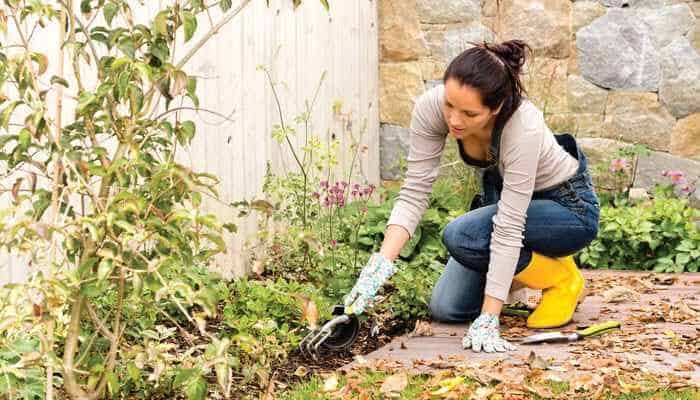 Cleaning up the garden can remove pests that would overwinter on plant debris and can help prevent problems next spring. Do a final weeding and put the weeds and other plant debris, that are not diseased, on the compost pile if you have one. Bring in stakes, row covers no longer in use, and grow netting. Bring clay pots, hoses and tools indoors for winter storage. Winter is a good time to clean, oil and sharpen tools, to scrub out and disinfect clay pots. Here is a rundown of other things you can do to get your garden ready for winter. Pull annual flowers such as impatiens and marigolds when frost kills the plants or when they stop blooming, and put the plants on the compost pile or dispose of them. Cut back perennials at the end of the growing season, too. Cut back stems to 3 to 4 inches from the ground. This summer’s intense heat and humidity were tough on East End gardens. Perhaps, like me, you had to cut your plants back early if the weather turned them brown. If your flower garden includes plants with woody stems, such as santolina, lavender and perovskia (Russian sage), do not cut these back in fall. If pruned in early fall they could send out new growth that would be very susceptible to winterkill. Instead, cut them back in spring. To protect the roots of perennials from being heaved out of the ground during alternate periods of freezing and thawing, mulch them when the ground freezes. Spread several inches of a loose mulch such as bark chips, compost or shredded leaves over the garden, around and between the cut-back plants. If you planted tender bulbs in your garden, which cannot tolerate freezing, such as caladiums, canna lilies, dahlias, gladiolus, tuberous begonias, and Peruvian daffodils, dig the bulbs in fall, before frost or after the first light frost, spread them on newspapers to dry, shake off the dried soil, and store them in a frost-free place. I put mine in paper bags in my unfinished basement, which is heated but cool. An attached garage would also work. If you have a rose garden, you should have stopped fertilizing before you read this article. Continue to clean up the rose garden, removing plant debris and fallen leaves, which could harbor pests. Keeping the rose garden clean is important to preventing pest and disease problems. After your garden has experienced the second frost, which happens at different times in different years, it is wise to detach climbing roses from their supports, gently lay the long stems on the ground, and cover with a good layer of mulch to protect them over winter. Don’t prune your roses now – that is best done in spring. Broad-leaved evergreen shrubs such as skip laurels, rhododendrons and boxwood are susceptible to harsh winter winds that can dry out the leaves and damage the plants. Spray the leaves of these plants with an anti-desiccant spray (all garden centers have them). In exposed locations, and especially if you live near the water, you can wrap the plants, especially boxwoods, in burlap to protect them. Driving around the East End in winter, you will probably spot landscapes with shrubs, probably boxwoods, neatly encased in burlap wrappings that will be removed in spring. Young trees and those with tender bark are favorite winter targets of mice and deer, who gnaw the bark. Protect them with tree wrap, plastic tree guards, or cylinders of hardware cloth around the trunks. Tree wrap also protects against sunscald, which happens when the tissues of a tree thaw on a bright, sunny winter day, then refreeze at night when the temperature plummets quickly. The rapid expansion of the freezing wood causes the bark to crack. Young trees are particularly at risk. Wrap them with tree wrap from ground level to right beneath the lowest branches. Check your gardens periodically over the winter to replace any protection that has become loose or dislodged. Then enjoy the winter holidays, when the Hamptons are quieter and our own again. NEXT ARTICLE > Color Pop!